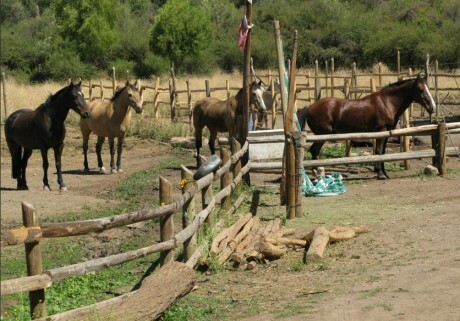 Our parcela holds Chilean horses for riding in the Andes, nr Santiago. Five years ago we moved from a rented piece of land near Santiago to a smaller, but our own, piece of land, or parcela as it is called here. Our parcela, or parcel of land, is smaller than the previous one, more manageable and nestles right under the steep slope of the pre-cordillera mountains near San Jose in the Cajon del Maipo. Our Santiago Day Rides go out of the back of the parcela directly onto the mountains, as do the rides with overnight camping. It is between the river and the mountains, and we can ride out of the back of it straight into the El Toyo estate with its 20,000 hectares (about 50,000 acres) of wild mountainside. Here there are streams and small rivers, cactus with flowers, huge quillays – a special native Chilean tree, evolved to withstand drought and now a protected species. The main ‘crop’ on our parcela – small piece of land – is Chilean horses, although we also try to grow grass to feed them, but never enough, and walnut trees. These are produced in this area and we have 70 young trees, hoping that in a year or two we will get some income from them, to help pay for all the extra hay that we have to buy for our growing number of horses. Growing, because we can’t resist buying another occasionally and also because the mares have foals and increase our stock. In spring and autumn the birds come down from the cordillera and are a feast to the eyes. We also have several queltehues – a sort of lapwing – living on our parcela and bringing up their babies. The word queltehue is thought to sound like their screaming cry, often heard in these parts of Chile. We have an occasional loica, with fat scarlet breast, a real red not the slightly orange colour of a robin, and altogether a bigger bird. In summer mirlos come and sit on the horses backs and eat the bugs off them. We are ideal for first time riders, families with children and are experienced in taking different levels of riders on the same tour. Day tours every day – Camping by request – English speaking guide also available. We customise every trip/tour to suit your needs and can also arrange transportation. Don’t hesitate to contact us – email rides@horseridingchile.com or you can use our enquiry form.